The PIPO X8 is an amazing little machine that’ll probably leave you at a loss for words. Why? 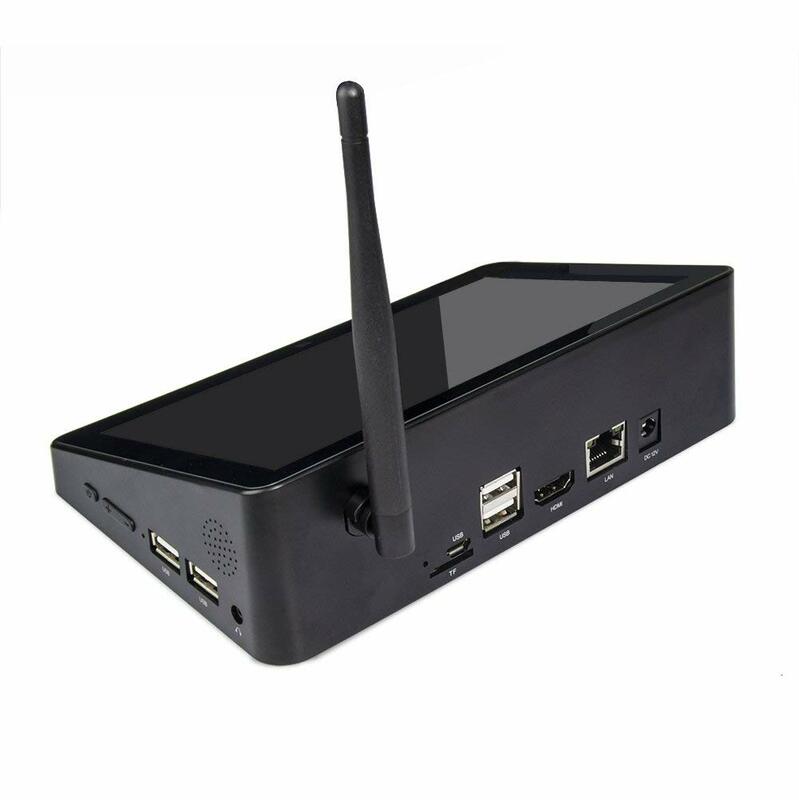 It’s a tablet, a desktop and a media box for your TV all in one device. Oh, and if that is not enough… it is also dual-boot. So every time you turn it on you get the option of it running either Android KitKat 4.4 or Windows 8.1 (with a free upgrade to Windows 10). Of course it has the standard size USB ports you are looking for, in fact it has 4 of them! The X8 seeks to emulate the mobile trappings of your favorite handheld tablet while infusing that machine with all of the functionality and oomph of a conventional desktop computer. While the X8 isn’t battery powered, the device it IS a lightweight PC that offers users more functionality than they probably know what to do with it. If we were to break the X8 down into its simplest label we would opt to call it a media box. The device functions with a touchscreen display and it feels lighter than a feather. You get all of the functionality of Windows 8.1 along with the ease of use of an Android tablet. The PIPO X8 is armed with an array of connectors for usage in your home theater as well as all of the meaty components that make up your desktop computer. Let’s break down this fantastic and diverse machine to see just what it can do for you. 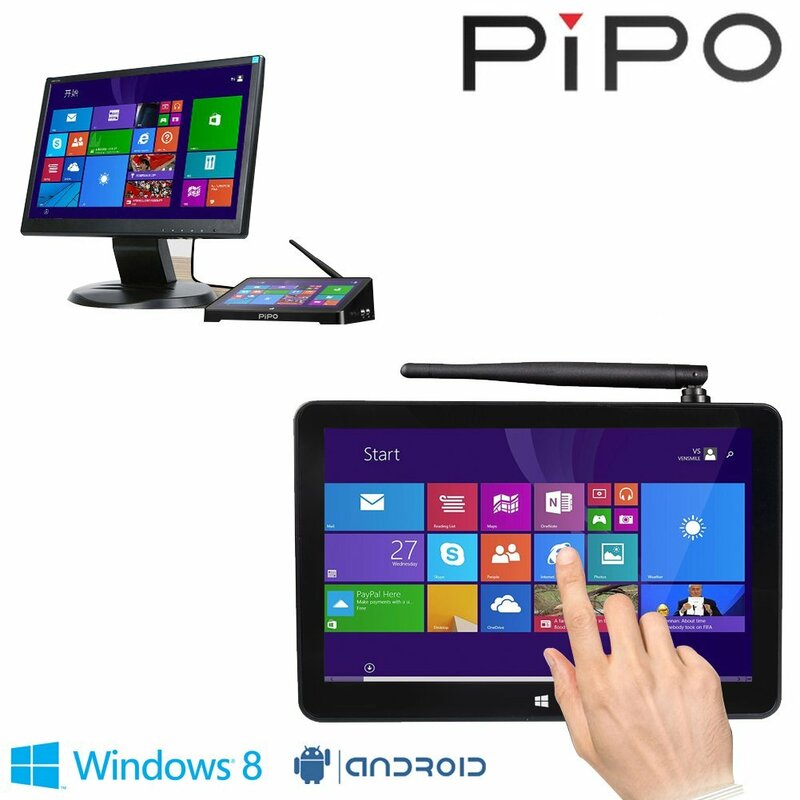 So the PIPO X8 is definitely unlike most tech products that you have seen in the Western markets. While Chinese developers have been putting out ‘media boxes’ for awhile now, nothing they’ve done really compares to what you are looking at. The X8 has a bulky shape but every part of the design was engineered to maximize your usage. Without the mobility of a wireless tablet, the manufacturers opted to install the screen on a slant so as to make it easy for you to always see. The box itself is shaped like a wedge with the sloping front and the connectors lined up on the sides. The case is made of hard plastic and it looks exceedingly modern. On the side, you have all of the different connectors, and there are quite a few of them. 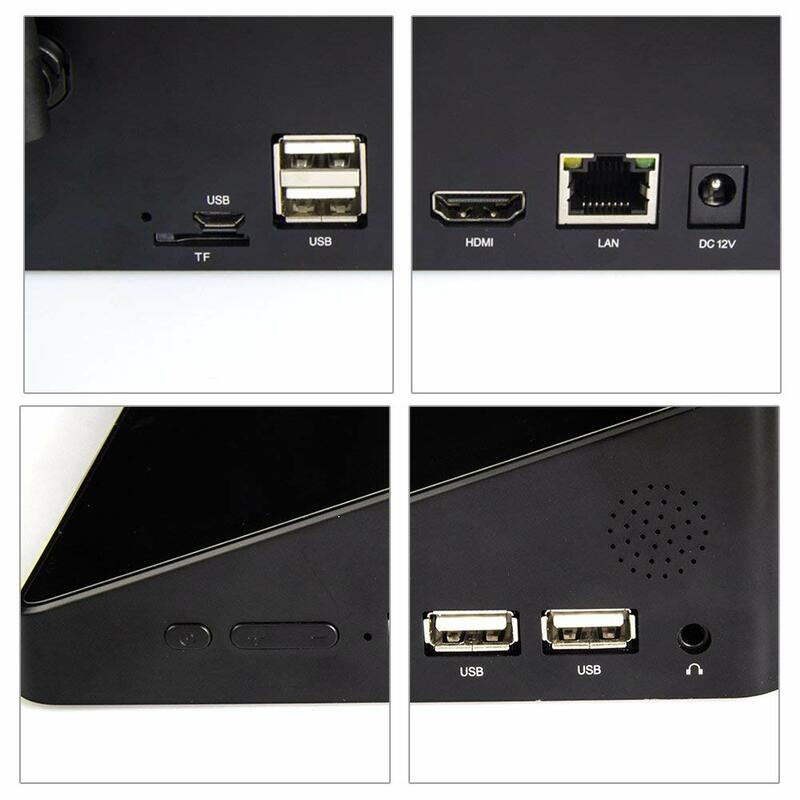 Your connector ports include 4 USB slots, an Ethernet port, a microSD slot, your HDMI input, and even an RJ45 LAN port. If you are planning on making the PIPO a core component in your home theater then you shouldn’t be running into too many roadblocks along the way. For the times that you won’t be porting out via HDMI, the on board speakers are more than capable. They produce more volume than your traditional tablet but not enough that you’d want to sub them out if you had multiple viewers on the screen. The screen itself is probably the coolest part of the PIPO because it is what makes the device so unique. If you didn’t have the expertly calibrated touch screen then you’d be looking at a machine more in line with the ROKU. Instead, you have a 7-inch screen with a 1024 x 600 display. The touchscreen is calibrated to 5-points that allow multi-touch inputs. If you don’t want to take advantage of the touchscreen you can opt to install your own USB or wireless keyboard/mouse systems in place instead. It’s up to you. You’ll notice that the X8 is also armed with an antenna to receive WiFi. The antenna boosts your ability to grab signal and you utilize the already solid wireless mechanisms inside. Streaming video to the device saw us receiving 5 bars of WiFi coverage and we didn’t have any buffering or stuttering issues. You also have Bluetooth 4.0 connectivity if you want to take advantage of that property. Alright so far what we’ve detailed is an ultra light, incredibly portable, tablet/mini PC hybrid. With that being said, you really are getting an incomplete portrait without knowing how strong the machine is on the inside. As we break down the specs and detail the various ready to utilize functions you need to keep in mind that this device is lighter than your phone, and that’s pretty crazy. Alright, so the basic PIPO X8 comes with 32 GB of internal storage with only a bit of that eaten up upon purchase by the O.S. 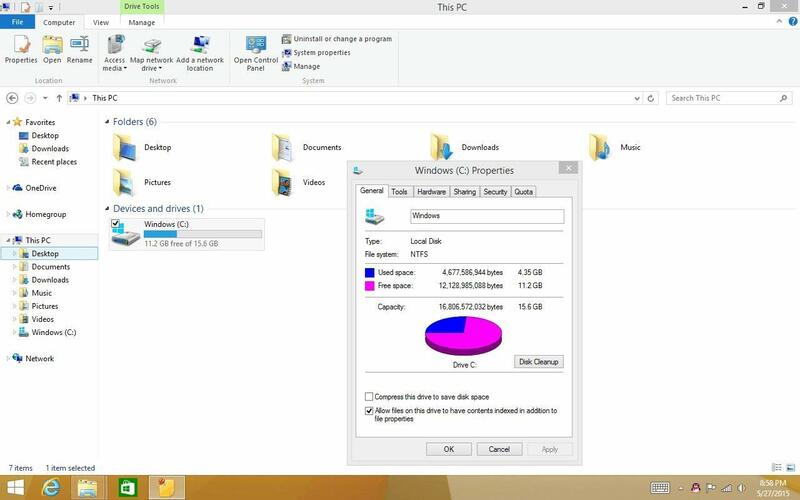 (Windows 8.1 to go along with Android 4.4/Bing). After you plug in the device via its power adapter you will launch straight into a fully functional version of Windows. This isn’t the stripped-down mobile version that you’d find in the Surface 2 tablet. This is all of the usability of an actual desktop computer, only it takes up the space of a book instead of an entire computer desk. 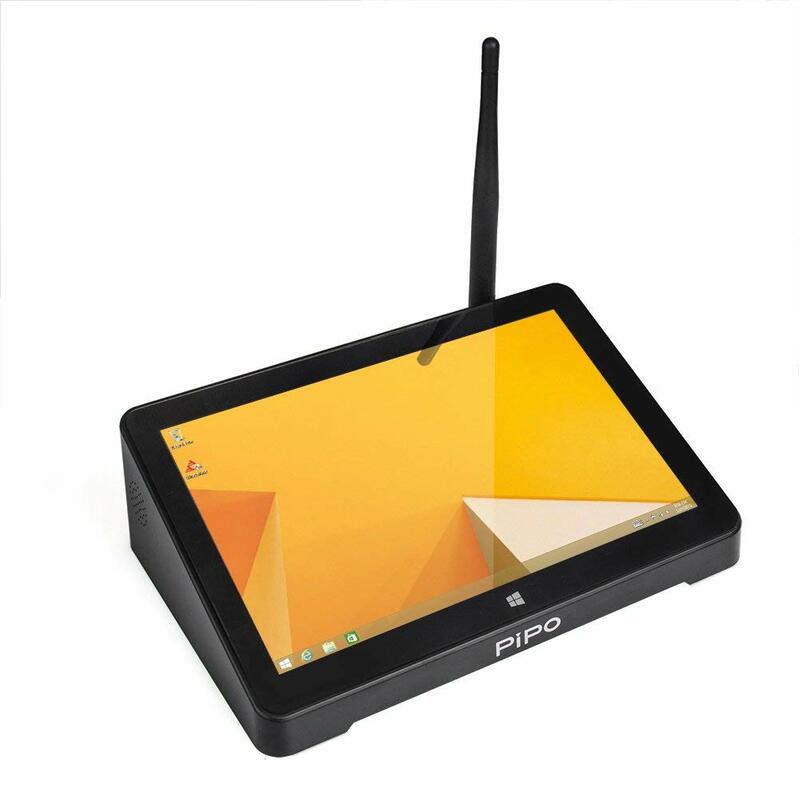 Functionally speaking the PIPO X8 was not any different from a regular desktop computer once you got logged into the O.S. There was no noticeable lag and any external devices we hooked up (keyboard, mouse) had no syncing issues. This is probably due in large part to the high quality Intel Z3736F chipset and the heavy-duty RAM allotment of 2 gigs. You have an Intel Baytrail processor with Intel’s HD graphics and this means that you’ll be able to run most mid-tier games at high quality, or high tier games at lower quality without any issues. All inspiring technology comes with a few setbacks and the PIPO X8 really is no different. Fortunately the problems we ran into with the X8 were relatively minor and they can even be avoided by reasonable usage guidelines. The biggest complaint most people will have is that the device needs to always be plugged in. That wasn’t a problem for us because we realized how much power was going on underneath the surface. That power creates the second and bigger issue: the PIPO X8 gets warm when you run it hard for a long time. We suggest avoiding using it as a lap device and leaving it on a flat surface. Those were the only two issues that we ran into with our time on the machine. With a price tag sitting at near $100 and the components of a quality computer in a bite sized package, there is no reason to pass up on the X8. The PIPO X8 is just too powerful, convenient, and affordable to need second thoughts. This is a multimedia master tool that gives you the mobility of a tablet, functionality of a desktop computer, and flexibility of a media hub. You can use the machine in your living room as a dedicated streaming box, buy it for the kids to do homework on, or leave it as a work computer you bring with you on the road. At the end of the day, the power in the PIPO X8 comes from your ability to do with it what you wish.